Bloomington, California may be a small town in San Bernardino, but our residents suffer the same disasters as everyone else. 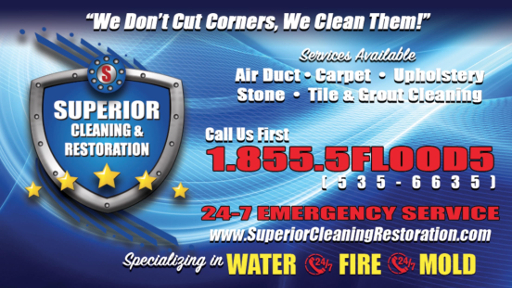 If you are in Bloomington and have suffered flood and water damage, call Superior Cleaning and Restoration Inc. today. We are here 24/7, accept many major insurance companies, and provide superior service. We can help you get through the stress involved with flood and water damage. Our professional cleaning and restoration experts are trained to cover every aspect of water damage cleanup. We will leave your property in a superior state. How does water damage cleanup work? First, the professionals at Superior Cleaning and Restoration Inc. will inspect your property and assess the necessary steps to fully restore it. Second, our technicians will begin the process, according to the analysis, to remediate your property. Whether it be commercial or residential, Superior Cleaning and Restoration Inc. can clean up your water and flood damage. Lastly, we will leave your property in a superior state. The flood might have caused structural damage, can you help? Superior Cleaning and Restoration Inc. most certainly can help. Our expert cleaning and restoration technicians are trained to perform every process of restoration. This includes general contracting to restore your property to its original condition. This is one of the reasons why we are available all day and all night. Floods can cause business stopping damage within hours. This damage can lead to months of lost business if you do not call professionals. Get in contact with us now. Don’t get caught with your feet in water, call the professional cleaning and remediation experts at Superior Cleaning and Restoration Inc. if you live in Bloomington, California. We are here for all of your water and flood damage emergencies, we operate around the clock to provide superior service, and we remediate commercial properties, as well as residential properties. In order to provide our superior service, we accept many major insurance companies, and will even work with you if you do not have insurance. Give us a call today to get your water damage cleanup started.